Windows frame our external world, inviting it into our homes. They are positioned in areas where we can maximise views, breeze, and light. As such windows are both functional as well as a design feature in our homes. A window can lift a dreary room, make spaces feel bigger and let in the fresh air. But it can also let in the noise, inclement weather and it can put our homes on display to the outside world. To create a feeling of privacy while still enjoying one of the best features of your home, choosing the right windows coverings is essential. If you have windows that are looking tired or dated, new window coverings can transform them in an instant. Window coverings have come a long way. Innovative designs in coverings mean dressing up windows has become one of the most rewarding parts of interior decorating. Modern Blinds’ window coverings are custom made so you can choose the colours, styles and designs you desire to match your lifestyle needs. Visionwood Venetians are a practical and stylish alternative to wood and they’re perfect for Queensland weather conditions. Our Woodnature range gives blinds a timber look without the challenges that sometimes come with timber blinds. In areas experiencing humidity and high traffic, a durable and easy to clean material keeps blinds looking their best. Visionwood blinds are also resistant to the cracking, fading and warping that can happen when timber is exposed to direct sun or too much moisture. This is a classic style that brings a natural elegance to windows, especially aluminium frames. Timber goes beautifully with most colours and styles, making this a highly adaptable décor option. Timber also frames natural settings beautifully. Panel Glides are a versatile, innovative development in interior design. 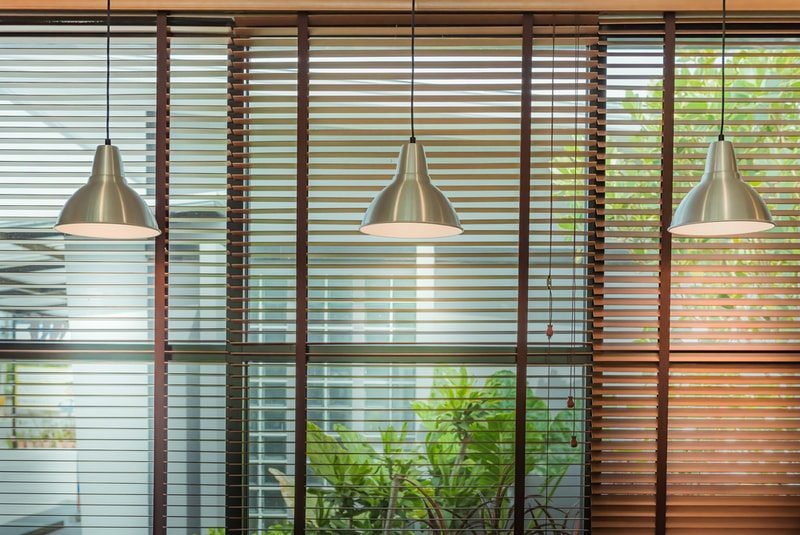 In the tradition of vertical blinds, the panels cover large areas requiring shielding and are easy to operate, opening from the left, right or centre. The glides come with their own hanging mechanism and are available in a range of colours, patterns, and styles. For classic elegance, simple white glides are perfect. To create warmth and a natural ambience, Sunscreen or light filtering fabrics are stunning, allowing light to filter through while still offering some level of privacy. Panel Glides are also popular as a room divider. These are practical and affordable, and they can be custom designed to match your interior décor. Rollers offer insulation and privacy while remaining sleek and unobtrusive. Bright or patterned designs are available as well as the new Vision design, which alternates sheer and block-out fabric slats so you can control the level of light filtration. Curtains are still one of the most effective and popular ways of transforming a room. Dramatic and rich or simple and sheer, they are durable and easy to care for. Curtains should you wish to re-arrange things, and they soften a window area perfectly with movement and flow. Sturdy curtains offer protection from weather and can fill a wide space. Custom made curtains mean you can have the exact width and length that you need, making it easy to transform your space instantly. Modern Blinds are experienced providers of window coverings from the Gold Coast to Brisbane and beyond. We offer a range of innovative designs that can be custom fitted to your windows and sliding doors. Contact us today for more information on the latest window coverings.